The back-to-school theme prompted me to think of a fun way to use a cookie for your child’s lunch that shows you are thinking of your son or daughter and wishing him or her the BEST day each and every day at school. These fun fortune cookies do just that. I like to write messages for my boys in their lunch boxes– notes as simple as “Hi!” for my preschooler and longer messages for my 3rd grader. And, yes, we all know that there comes a point that writing “Mommy loves you!! !” with lots of hearts and XOXOXO just might not be as sweet and caring to your older school-aged child as moms wish it would be. So, I’ve moved on to sending jokes, riddles and little brainteasers. Fortune cookies allow that same message-sending fun to be done inside the cookie. Write a joke, a note, a math problem– whatever you’d like– and package it in this tasty cookie as a surprise. 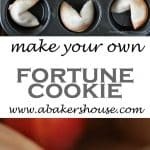 This was my first attempt at fortune cookies and it didn’t go as smoothly as I’d hoped, but once I got the batter the right consistency and the folding method perfected for the shape, it was really fun to assemble these treats. I think the same idea would work well for many occasions– birthday wishes, teachers’ gifts, thank you notes, even hostess gifts. How will you share your fortune cookies? I’d love to hear your ideas! Please note that I did not make substantial changes to the ingredient list of the original recipe except to add more liquid. The change that made a BIG difference in my experience was increasing the oven temperature and decreasing the baking time. I went from throwing out batches to being very pleased with the results. The lower temperature did not create enough heat for the cookies to fold easily after baking and without the added liquid the batter was too thick. Experiment and see what works best for you. 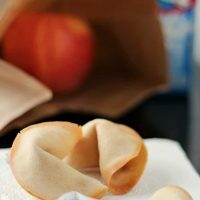 Adding a special note inside these fortune cookies is a great idea for school lunches, Valentine's Day, or even a proposal! Write your messages on the papers then fold in half lengthwise. Mix together the flour, confectioners' sugar, and salt; set aside. In a separate bowl beat the eggs whites until slightly foamy then add the melted butter, cream, water and vanilla. Combine the wet and dry ingredients and stir until well blended. The batter will be slightly thicker than pancake batter but not as thick as something like chocolate chip cookie dough. Spoon about one tablespoon of batter onto a cookie sheet covered with parchment. Use the back of a spoon to quickly spread out the batter into a circle about 3-4 inches wide. The batter will be thin but should not have gaps within the circle. Make 4-6 circles per cookie sheet. Bake for 14-15 minutes or until edges just start to brown. 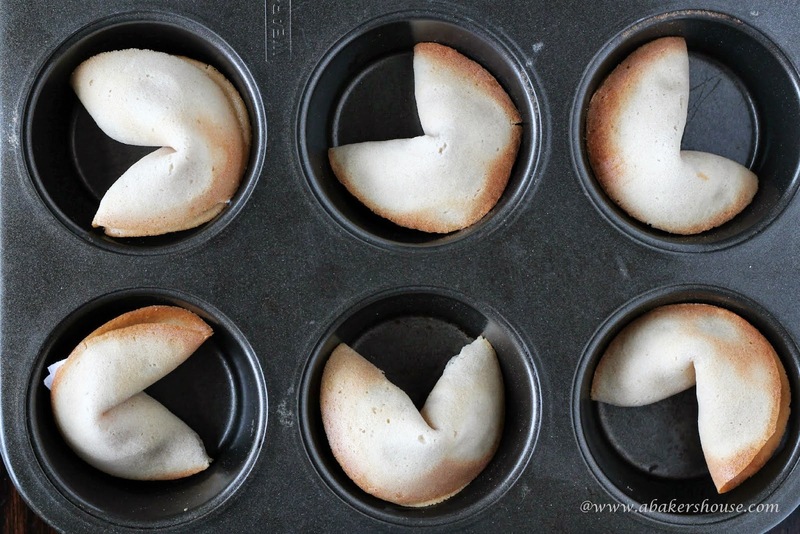 Remove cookies from oven and very quickly work on forming the shape of your fortune cookie. Take your papers and fold the circles in half over the papers. Immediately fold the ends of your semicircle together (bending the cookie over the side of a mug helps this step) then place the folded cookie in a muffin tin. Remember the cookies will be HOT so be careful that your fingertips don't burn. What are you celebrating? Send special messages in these cookies for teacher appreciation presents (have each child write a note), birthdays, anniversaries and other special occasions. The muffin tin trick worked wonders for me– I found that tip and others on this site. Welcome to the first collection of recipes from the group, Creative Cookie Exchange. Laura who blogs at The Spiced Life and Rebecka of At Home with Rebecka, have formed a group of happy cookie bakers who love to bake, eat and share their cookies. 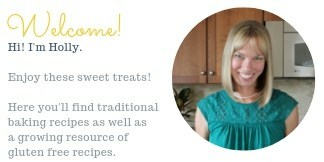 I am excited to be part of the group and look forward to another great excuse to bake cookies each month. Won’t you join us? We’ll have a new theme each month where you can bake along and share your favorite cookies on the link-up below. September’s theme is “Back to School” Cookies– cookies that can either be packed in a child’s lunchbox or shared as a special treat at the end of a school day. Let’s get baking together! Now back to the #CreativeCookieExchange. Look what the group baked this month! You get my vote for Mother of the Year! No kidding! This is a fabulous idea and what child wouldn’t want to get a specially made fortune cookie in his or her lunch box! Well done, Holly! Thanks for your sweet comments, Stacy! I think I’ll make fortune cookies more often now that I’ve overcome the intimidation factor in baking and forming them. They were not that tricky after all! What an adorable idea for lunchboxes and teacher appreciation gifts. Thanks for the tips. This is so cute. Thanks, Karen, wouldn’t it make a sweet teacher’s gift with each child writing down a message for his teacher? I’ll have to remember this when Teacher Appreciation week comes around in May this year. I’m going to have to make these beauties! Great job with this month’s Creative Cookie Exchange theme, Back to School cookie recipes! Thanks for co-hosting the party. You rocked it this month what might you whip up for us next month?? Can’t wait to see! Thanks to you and Laura for getting the group started. We are going to enjoy all this cookie goodness for months to come! Thanks for all your time spent getting the links and code for us all. Thanks so much! These were fun to make too! HOLY MOLY! My kiddos would LOVE these cuties! WOW! You are a super star mom!!! LOVE em! Thanks, Yvette! It’s funny because my older son has eating issues and doesn’t get near cookies. he did touch these and broke them open, which is a big deal for him to approach a new food. He loved the messages inside. My younger son ate them, thank goodness! Wow! These are so cool. I never would have thought to make my own fortune cookies. They probably taste a lot better than the cardboard-y ones at Chinese restaurants. 🙂 And such a cute idea for school lunches. Thanks, Sophia, I think now that I’ve gotten over the initial intimidation factor of making these that I will do it more often. They would be cute favors for parties too. This is an inspired idea! I think that this would be so popular if my daughters took a batch of these to school. I have doubts that my cookies are going to look as perfect as yours do. Thanks, Felice, I am sure your cookies would be just right! My second batch was better than my first and my third better yet. Kind of like pancakes, at least for me. It’s been a fun start to this month of cooking baking! Oh what a brilliant idea for cookies to pack in lunches! Or for parties or special occasions. Thanks, Renee, I agree, these cookies could be used for so many occasions– favors, parties, gifts and more. What fun! How much do I love, love , love this idea!!!! I can’t wait to try it!! Soooo cool! Thanks, Karen, I hope you have fun making these too! Oh, I love these!! I’ve never, ever thought of making my own fortune cookies, but what a great idea. Love the little notes inside and that I can make them whatever I want. Thanks, Kim, I think I’ll make these again soon too. They are time consuming since you have to work so quickly with them when they get out of the oven and small batches are best, but it was fun to see such cute cookies all lined up when I was finished. Hope you enjoy baking them too! Fun and cute and so very thoughtful. Love it. I love baking cookies. I think I will join you all soon. Very cute, I would just love to have had these in my lunchboxes as a child! I wanna try making them! This would be a fun cookie to make with children. The only tricky part is forming the cookies while they are hot, so that might need help from an adult depending on how old the kids are. Happy baking! Wow, these are awesome! I love the idea and will definitely have to try these. I loveeee fortune cookies. This was my first try with fortune cookies, Miranda, and I hope to try other variations on the recipe soon too. Thanks for your comment! What an lovely idea, I often put little notes in the lunch box, but you idea is just great. Thanks for your comment. Isn’t it fun to leave notes in lunch boxes? Even a smiley face can brighten a day! 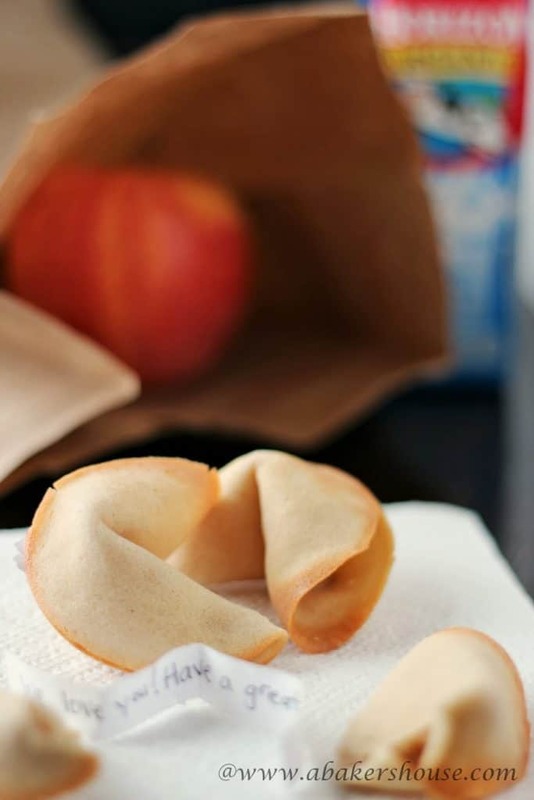 These fresh fortune cookies are a fun way to enjoy a lunch box treat. It is a great way to share and put a smile on someone’s face. Thanks, Velva, it’s always nice to find a way to send a special message to our kids. My next batch might be making notes for my grandmothers to enjoy. I think this is absolutely brilliant. My kids would be floored if I did this! Thanks for joining us! Your idea is wonderful. My kids love fortune cookies. My 12 year old might even think this is pretty cool as long as I don’t make the messages to emotional, it’s getting pretty hard to win her over! Thanks for the inspiration!! Thanks! Yes, it gets harder as they get older, doesn’t it? Maybe you could write jokes or even logic/math problems for your 12 year old.